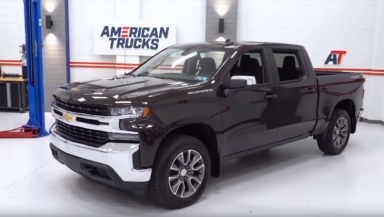 PAOLI, Pa. (October 30th, 2018) – In this episode of AmericanTrucks’ (AT) “The Haul”, Adam Maqboul has the 2019 Chevrolet Silverado LT All Star Edition in the AT garage for a complete review, walkaround and test drive. Adam highlights all the new features in the 2019 model, pointing out improvements in styling and functionality across the board. Join Adam as he takes an in-depth journey in, around, and underneath the new 2019 Silverado. He explains the updated truck’s benefits as well as the new materials used to shave almost 500 lbs. off from its predecessor. AmericanTrucks is among the most reliable online aftermarket retailers for F150, RAM, Sierra, and Silverado parts and accessories. Catering to the needs and demands of late-model truck owners and enthusiasts, AmericanTrucks provides the best parts with support from genuine truck experts. Located just outside of Philadelphia, AmericanTrucks is dedicated to offering the truck community with the highest quality of parts and customer service.